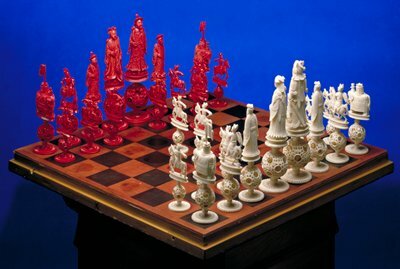 Image: A chess set for sale from The House of Staunton company, made from mammoth ivory. Timed to coincide with the recent announcement by China to halt its commercial trade of ivory, “Elephant in the Room: Ivory” is a series highlighting the historical use of ivory across cultures represented in Mia’s collection. As China is the largest market for ivory, taken from tens of thousands of endangered elephants and rhinos killed by poachers every year, the ban could help save the animals from extinction.